Whether it’s a wind farm, a coal-fired power plant, a nuclear reactor or even just a big box store, there are always going to be locals opposed to it, declaring “not in my back yard!” (NIMBY). 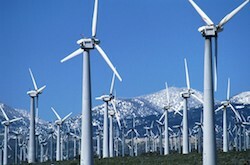 As to the attractiveness of wind farms, people do seem to come down on one side or the other rather vehemently. Those in favor of wind development have been known to extol the visual virtues of a horizon full of windmills not only for the turbines’ graceful sculptural lines but also for the fact that their very presence advertises the coming of a modern, almost futuristic age of clean, renewable energy. Respondents to a survey by the British magazine Country Life listed wind turbines as the most egregious type of architectural blemish across England. They disliked wind farms even more than other “eyesores”—such as highway service areas, conventional power stations and ugly office buildings—because of the size of the turbines, some of which are 300 feet tall, and their intrusion on the landscape. Opponents of a proposed wind farm in the waters of Massachusetts’ Nantucket Sound cite similar gripes. The builder, Cape Wind Associates, has campaigned for seven years for approval of the development, to be located 16 miles off the shore of Nantucket Island. Homeowners, politicians and some evidently conflicted environmentalists have mounted stiff opposition to the facility, which would appear from shore as distant white smears on the horizon. The decision rests with the U.S. Interior Department which, despite stated desires to expand offshore wind energy, is taking its time on the highly contentious matter. But with wind now the hottest renewable energy source going, those opposed to seeing windmills better get used to it. In 2008 wind power provided 1.5 percent of global electricity—having doubled its output every year now for five years in a row—and should account for as much as eight percent by 2018. SEND YOUR ENVIRONMENTAL QUESTIONS TO: EarthTalk®, P.O. Box 5098, Westport, CT 06881; earthtalk [at] emagazine.com.